February 28, 2018 is Rare Disease Day. In honor of that day, we thought it would be the perfect time to provide our annual rundown of the past calendar year in orphan drug designations and approvals. And what a year 2017 was for orphan drugs! 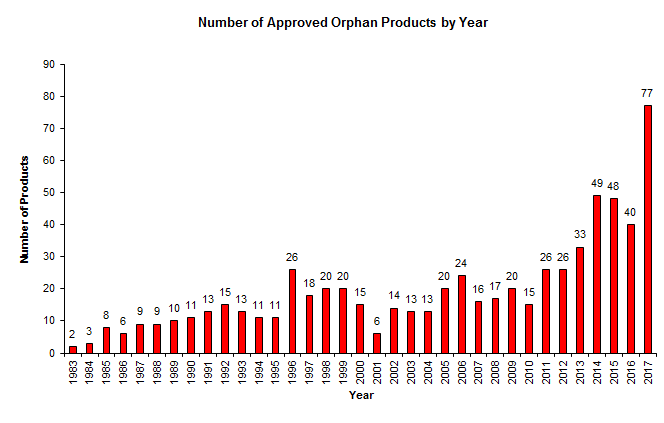 As we’ve previously said, hardly a day goes by that we don’t see a press release or announcement that a company has requested or received from FDA’s Office of Orphan Products Development (“OOPD”) designation of its drug or biological product as an “orphan drug.” And there’s a good reason for that: FDA received orphan drug designation requests at a near record rate of 1.4 per day (more than 2 per work day) in 2017, and granted designation requests at a record rate of 1.3 per day (more than 2 per work day) in 2017! In 2017, FDA’s orphan drug program continued to break new ground. Orphan drug designations and approvals (which include not only approvals of NDAs for new molecular entities and BLAs for original biological products, but also applications approved for new orphan uses of previously approved drugs and biologics) skyrocked compared to previous years. FDA granted 77 orphan drug approvals, and granted 476 orphan drug designation requests. 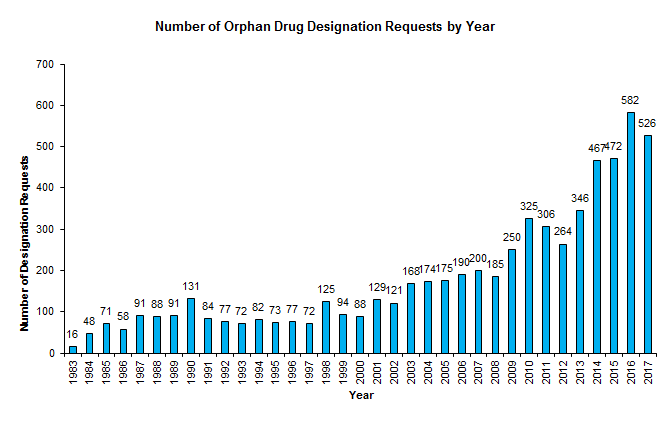 Those numbers obliterate the previous records of 49 orphan drug approvals (2014) and 355 orphan drug designation requests (2015). The increase in orphan drug designations may be attributed to FDA’s Orphan Drug Designation Modernization Plan, which targeted the elimination of the backlog of pending designation requests. FDA’s OOPD also received a near record 526 requests for orphan drug designation in 2017. That’s a slight dip over the 2016 record of 582, but still not too shabby! 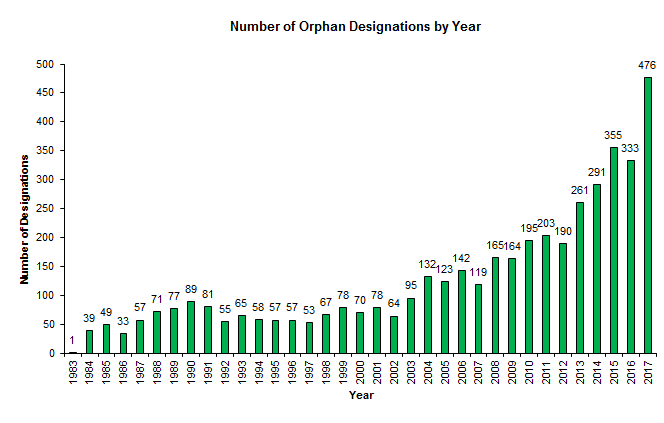 Since 1983, FDA has granted more than 650 orphan drug approvals, has granted nearly 4,500 orphan drug designations, and has received more than 6,300 orphan drug designation requests. Below are three tables – one for each metric we track – showing the year-by-year numbers since 1983. The numbers are largely based on information from FDA’s Orphan Drug Designations and Approvals Database. New efforts FDA announced this week could mean that new records will be set in 2018. Those new efforts include a pilot program for more efficient orphan designation requests. The components of the pilot program include a fillable form intended to make the designation process easier for sponsors and more efficient for FDA to review, an on-line tutorial to guide sponsors through the submission process, and a new inter-center consult process to streamline and standardize the Agency’s communications process.